In December 2017, Congress passed major tax legislation that is informally known as the Tax Cuts and Jobs Act (TCJA). By reducing revenues and increasing debt service costs, it will increase federal deficits by approximately $1.9 trillion over the next 11 years—from fiscal years 2018 to 2028—according to the nonpartisan Congressional Budget Office (CBO). House Republicans are now considering a second set of tax cuts that, like the first round, are skewed to the wealthy. The primary elements of this second tax plan—extending expiring provisions of the TCJA—would add another $631 billion in deficits over that same period. But the cost of the tax cuts over the next decade is just the tip of the iceberg: The cost would truly explode over the long term. 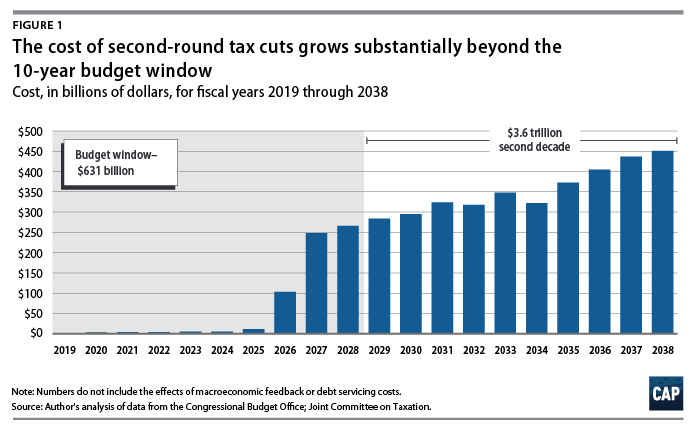 An analysis of the second round of tax cuts shows that its primary elements would add approximately $3.6 trillion to deficits in the second decade—FY 2029 to FY 2038. The TCJA contains many provisions that changed the individual income tax system. The TCJA also cuts taxes on wealthy estates. (see text box) But nearly all of the individual and estate tax provisions were “sunset,” meaning the legislation provided that the changes would expire after 2025. The reason that the bill’s authors made these provisions expire then was to manipulate the bill’s official cost estimate so that it could comply with rules imposed by the congressional budget process. Adhering to these rules was necessary to allow the bill to pass with a bare partisan majority in the Senate, rather than 60 votes. The centerpiece of the second set of tax cuts being considered by the House majority is making these “sunsetted” provisions permanent. The purpose of this column is to make estimates of the cost of doing so. Under the traditional 10-year budget window, the costs of making the sunsetted provisions permanent occur only in the last few years of the window. There may be some costs in earlier years, as some taxpayers execute tax planning or shift income or deductions from one year to another. But these effects should be relatively minor. The total cost for these years is about $631 billion, a significant sum. But to understand the real and lasting costs of the provisions, one needs to look at the cost over the second 10 years: FY 2029 to FY 2038. To date, there have been no published CBO estimates of the costs of making the sunsetted provisions permanent. To provide such estimates, this column combines two sets of data from the CBO that have already been published separately. The methodology for doing so is presented in the next section. The Tax Policy Center (TPC) and the Center on Budget and Policy Priorities (CBPP) have recently released their estimates of such costs, which show similar results. These estimates are discussed in the “Results and conclusions” section below. Each calendar year, the CBO publishes projections of annual federal revenues, outlays, deficits, and debt held by the public for the current year and for the next 10 years. In addition, the CBO publishes projections of these annual amounts for a number of scenarios for the next decade—in this case, FY 2029 to FY 2038. In one scenario, called the extended baseline, the CBO extends the projections for the first 10 years under the assumption that current law generally continues unchanged for the second 10 years. In particular, revenue estimates for the second 10 years assume that the individual income tax and estate tax provisions in the TCJA that sunset on December 31, 2025—during the first 10 years—expire as scheduled under current law. The CBO’s first extended alternative fiscal scenario assumes that certain policies that are currently in effect are extended indefinitely. For example, this scenario assumes that the individual income tax and estate tax changes made in the TCJA do not expire on December 31, 2025. Thus, by subtracting the estimates for annual revenues for the second decade under the first extended alternative fiscal scenario from the same annual revenue estimates using the extended baseline scenario, we are able to isolate estimates of the change in revenues from continuing current policies, including the TCJA individual and estate tax changes. Extend other expiring revenue provisions. This alternative would assume that a large number of other, non-TCJA provisions that expire during the first 10 years do not expire. The revenue losses and associated budget deficits arising from the primary elements of the House plan are shown in the table for each year of the second 10 years, with the total for the 10 years presented at the bottom. The table indicates that the total deficit without debt service costs for the 10 years of the second decade is approximately $3.6 trillion. The estimates by the TPC and the CBPP are similar—approximately $3.2 trillion and $3.3 trillion, respectively. This cost would be in addition to the cost of the original TCJA. For those concerned about deficits and debt—including anyone who rightfully worries that deficits of this size would lead to huge cuts in Social Security and Medicare—the additional trillions of dollars added to deficits offer a strong reason to oppose any new tax cut legislation that includes these primary elements of the House plan. Alan Cohen is a senior fellow at the Center for American Progress. Author’s notes: The nonpartisan Joint Committee on Taxation (JCT) estimates that H.R. 6760, the legislation to extend the individual and estate tax provisions of the TCJA, would add $631 billion to deficits over FY 2019 to FY 2028. The House Ways and Means Committee is expected to consider two other bills—H.R. 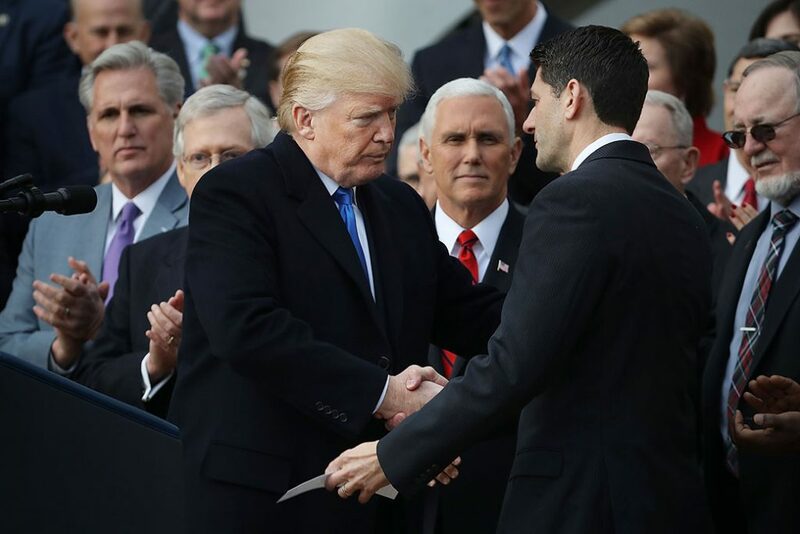 6757, the Family Savings Act of 2018, and H.R. 6756, the American Innovation Act of 2018. The JCT estimates that these two other bills would add $21 billion and $5.4 billion to deficits over FY 2019 to FY 2028, respectively. When legislation is being considered, it is customary for the CBO to show the budget effects for the current year (if any) and the effects in the next 10 years. These 10 years are sometimes referred to as the 10-year budget window. When the TCJA was being debated, the current year was FY 2017—which had already taken place—and the 10-year budget window was FY 2018 to FY 2027. The CBO updated its estimates of the TCJA on April 9, 2018. At that time, the nation had already entered the next 11-year budget cycle in which FY 2018 was the current year and FY 2019 to FY 2028 was the 10-year budget window. That is why in its update the CBO showed projections for the 11-year period from FY 2018 to 2028. If the second set of tax cuts is considered this September, the current year will be FY 2018 and the 10-year budget window will be FY 2019 to FY 2028, the same 11-year period for which the CBO’s updated estimates for the TCJA were presented. Thus, it makes sense to consider the CBO’s estimates for the TCJA over this 11-year period—FY 2018 to FY 2028.